Kathleen Mary Atcherley [ ] was in her fortieth year when the Second World War broke out in September 1939. A daughter of Roger Atcherley, who left effects valued at nearly £4,000 when he passed away in 1936, Kathleen would have been reasonably well off, with plenty of leisure time to pursue her twin passions of gardening and golf. Kathleen was not afraid of hard work however. Called upon to “do her bit” for Britain in World War Two, she joined the ranks of the Home Grown Timber Production Department and helped to put the ‘tree’ into ‘victory’! With her two younger siblings (Margaret Ellen Atcherley and Roger Philip Atcherley), Kathleen had spent her earliest years in the parish of Eccles, Lancashire, where she was born on 17 May 1898. By 1911 they were living at Southport, and in 1914 when Kathleen and her sister Margaret were Confirmed at Sefton Church the family was residing at Blundellsands. Both Southport and Blundellsands are on the coast of Lancashire, a coast well known not only for its holiday resorts but also for its many golf courses (Royal Birkdale for example). These would doubtless have been an attraction for Roger Atcherley, who played regularly at the Worsley Club when living in Eccles. Evidently he passed his love of this sport on to Kathleen. She was almost certainly the “Miss Atcherley” who in 1931, when living at Huyton (most likely with her brother Roger), competed with a Mrs Forster in the Ladies Northern Foursomes Golf Tournament at Woodhall Spa in Lincolnshire (see photo below). Sadly this twosome did not progress beyond the third round. War, of course, changed everything. With supplies from overseas much reduced, Britain needed to make the most of its own resources. Among those resources were the trees and shrubs of Britain’s farms and forests, hence the establishment of the Home Grown Timber Production Department by the Ministry of Supply. And with many of the nation’s young men away fighting, women were called upon to work in fields (and indeed woods) which would have been unfamiliar to many of them. Seldom Seen. What an appropriate name for a house so hidden away! It was brought back to my memory very clearly as I looked through my Lakeland calendar and saw the picture of the farm house in which a friend and I had stayed during the late war when we were working for “Home Grown Timber Production”. Our instructions were always to try and get a billet as near to the wood as possible, in order to save petrol. In our search, we drove up a rough road and just caught a glimpse of the house in a hollow, as we looked over a field gate. Everything was covered with snow as it was winter and we had to leave our car in a shed at the end of a lane and stagger through drifted snow, carrying our suitcases and spare boots. The farmer’s wife provided masses of food and, after a good sleep between blankets, as sheets were judged to be ” too cold in th’winter”, and a huge breakfast, we were off the next morning about 7.30 a.m., armed with thermos and sandwiches. We ploughed our way up hill, the wind blowing the top off the snow, down our necks and into our eyes, until we came to the wood which was a semi-circle of trees, in area about six acres, hanging on to quite a steep slope and consisting mostly of pines and a few larch — all much in demand for pit-props. Too cold to rest, we started work right away, one measuring the trees with a timber tape while the other entered the resulting figures in a book — alternating the procedure about every fifteen minutes. When our fingers were too cold to do either job, we walked to the edge of the wood where the sun was by then shining on the snow, and enjoyed our first break for coffee and sandwiches. The warmth of the sun as it climbed higher brought down the pungent smell of the pines to where we worked and it was a rare occurence to catch a cold in spite of the wintry weather. At the end of nine hours work we collected our impedimenta and started off for the billet where, after a clean up and a good hot meal, we settled down by the light of an oil lamp to transcribe the results of our labours into cubic feet of “good, bad or indifferent” timber, which would be bought by the government. After several months of this sort of work all over the North, we received a telegram, most unexpectedly delivered to us actually in a wood, recalling us to H.Q. Here we were informed that we had been chosen to start a new, small industry in the North of England. We were sent down to the New Forest to learn the ropes from a Lancashire girl, who was in charge of the only other site in England. When we had learnt all she could teach us, we returned to the North, where our first job was to find a suitable site, as near to a railway as possible. We were lucky to find exactly what we needed, rent free, from a kindly landlord. The next thing was to engage women workers to help us. They came from a variety of backgrounds; I remember one was a station-master’s wife. We also found a man to do the heaviest work and to act as a sort of overseer. Finally we were allocated six Land-Army girls, who worked in pairs. My friend and I motored miles, looking for a shrub calledRhamnus frangula or Alder Buckthorn. We had to find out who owned the land on which it grew and then make an appointment with the owner, or his Agent, to get permission to cut down the shrub. Three of these sites had to be found, and three billets near to them for each pair of Land-Girls, whom we then had to transport to their various destinations. The girls sawed down the bushes and then cut them into pieces about 3-feet long and made these into bundles of approximately 30-lbs. in weight. When they had completely cleared the site, they would send a message and one of us would go to fetch them and their wood back to the factory, where the man kept two huge tanks of water boiling. Three or four bundles of wood were dropped into each tank and kept at simmering point for a couple of hours. After this, they were given over to the women workers who peeled off the bark with short, sharp knives while it was still hot. The man then rebundled the wood which was sent to South Wales to be made into percussion caps for Ack-Ack shells. The bark was carried to our drying shed, where sheets of corrugated iron were heated over a flue from a wood fire. The bark was spread on these sheets to dry gradually and then cool off, before being bagged and sent to London to be made into cascara, which commodity could not be imported as usual from South America. I enjoyed this wartime work enormously, but what a difference from the pre-war days when I ran my father’s home, superintending both indoor and outdoor servants; keeping the peace between gardener’s and chauffeur’s wives, both of whom helped at busy times in the kitchen with jam and jelly making, salting beans and drying herbs, etc. Gardening and golf were my main hobbies and the former remains so to this day. For twenty years after the end of the war I lived with my brother in a 260-year-old cottage in Westmorland, sitting on the Local Bench for eighteen of them and doing a great deal of political work, with some fly-fishing for relaxation. During this time I compiled a cookery book, to be sold in aid of the Church funds. I received many recipes for this book from amongst the ninety-five landladies with whom I had stayed while doing my wartime job and to whom I dedicated the book in gratitude for their unfailing kindness. Now we have come to live in Dorset where the climate is softer and better for my rheumaticy knees and where we find the people both warm and friendly. I still manage to garden a little; and in the summer I go down to the pier and fish, with the helpful tuition of the local lads — a very different business from fly-fishing. In fact, I thoroughly enjoy what I suppose is my old age, and even write those two words with a sense of disbelief. Picture credits. Mrs W Forster and Miss Atcherly waiting to compete in the ‘Eve’ Ladies Northern Foursomes: J. Gaiger/Topical Press Agency/Getty Images Editorial image # 3403736. 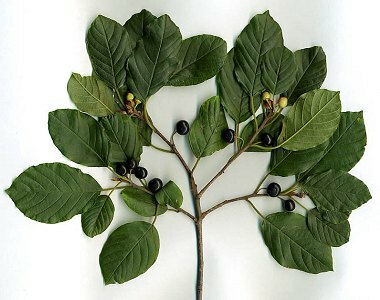 Alder Buckthorn foliage and fruit: Photo by “MPF”, taken from Wikimedia Commons and used under the GNU Free Documentation License, Version 1.2. Birth of Kathleen Mary Atcherley registered at Barton on Irwell, June quarter 1898; volume 8c, page 694. Death of Kathleen Mary Atcherley registered at Weymouth, September quarter 1978; volume 23, page 0852; date of birth given as 17 May 1898. National Probate Calendar (1936) shows: ATCHERLEY Roger of Howtown House Howtown Westmorland died 23 February 1936 Probate Liverpool 20 July to Roger Philip Atcherley fruit merchant and Kathleen Mary Atcherley and Margaret Ellen Atcherley spinsters. Effects £4823 11s. 8d. Copy viewed at Ancestry. 1901 census of England Wales. Piece 3658, folio 53, page 8. Didsbury House, Ellesmere Road, Eccles, Lancashire, England. 1911 census of England Wales. Piece 22872, Schedule 66. 78 Park Road, Southport, Lancashire, England. Roll of Persons Confirmed from the Parish of [Richmond] St Anne [Lancashire] shows, on 11 Apr 1914 at Sefton Church: Margaret Atcherley, 14, and Kathleen Atcherley, 16, both of Norwood B’Sands [= Blundellsands]. Copy viewed at Ancestry – Liverpool, England, Confirmations, 1887-1921. London Gazette, issue 34387, page 2328, 9 Apr 1937: “NOTICE is hereby given that the Partnership heretofore subsisting between us, the undersigned, Rennell Atcherley Pugh … and Roger Philip Atcherley formerly of “Barn Hey” Huyton in the said county but now of Lowther Newtown in the county of Westmorland …” Copy viewed at London Gazette website. Kathleen M Atcherley (1971), Silviculture in Wartime. In: Scottish Forestry (Royal Scottish Forestry Society), pages 46-48.